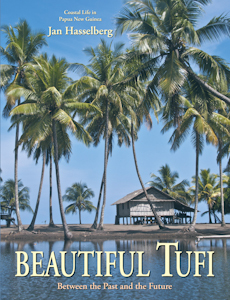 Just south of Tufi is Collingwood Bay. It’s a wide, beach-lined bay with a mix of tribes and languages, and with a history intertwined with their northern neighbours. To find out about a mining project in the test drilling stage and a logging project of doubtful legality, I made my way down there, but I was also in for a wonderful and memorable visit. It materialised in an article for AirNiugini’s Paradise magazine. Here are some lines from the article, and further down you’ll find a link to the full article. After passing the last houses, the banks of the Vayova River had come a little bit closer to our gently moving canoe, and soon coconut fronds and tall forest trees were forming a ceiling over our heads. 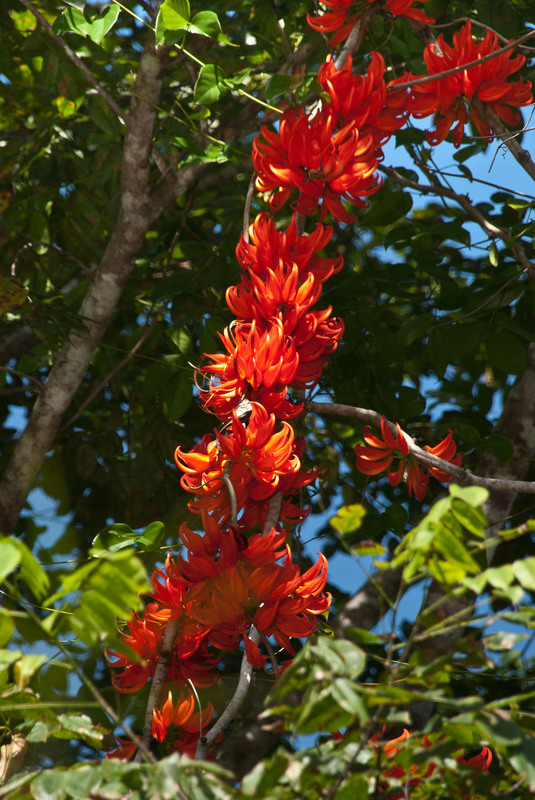 The fiery, bright blossoms of the New Guinea Creepers lit up the greenery like strings of Chinese lanterns in orange and red, some places hanging straight down, while others drew beautifully curved arabesques above us, almost like circles. What a fabulous and colourful way to mark the start of our little expedition. Joe and Moses were my companions and we were going up to have a look at the lake just north of the two hills behind the Uiaku and Ganjiga villages. For more than a hundred years this lake was only visited on special occasions – there is a sad story behind this – but now the young men go up there fishing, and they have decided it should be alright for a stranger and waitman to visit as well. After the short canoe ride I was looking forward to a long, nice walk through the forest. One can’t visit the Maisin people without purchasing a prime piece of tapa cloth, and Betty is one of the experts. 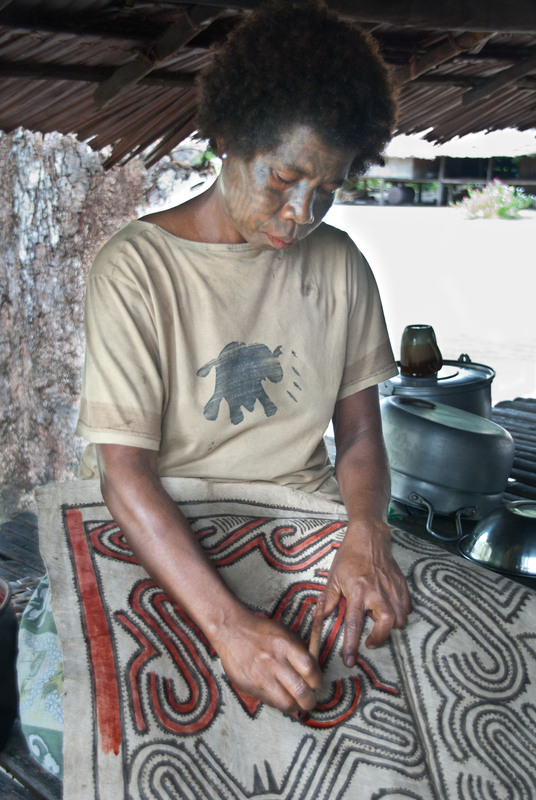 Tapa has been made for centuries along the northern coast of PNG and the Maisin have a well founded reputation for making the best. Betty had one that was almost finished, and I could tell it was going to be a great one, with the traditional parting into four similar sections. It was going to be a girl’s or woman’s tapa, which they wear as a skirt when they put on their traditional costumes, so it was much bigger than the loin cloth variety that are for the men. The black contours were already in place and showed a beautiful, decorative pattern with iconic ocean waves on the top and bottom. 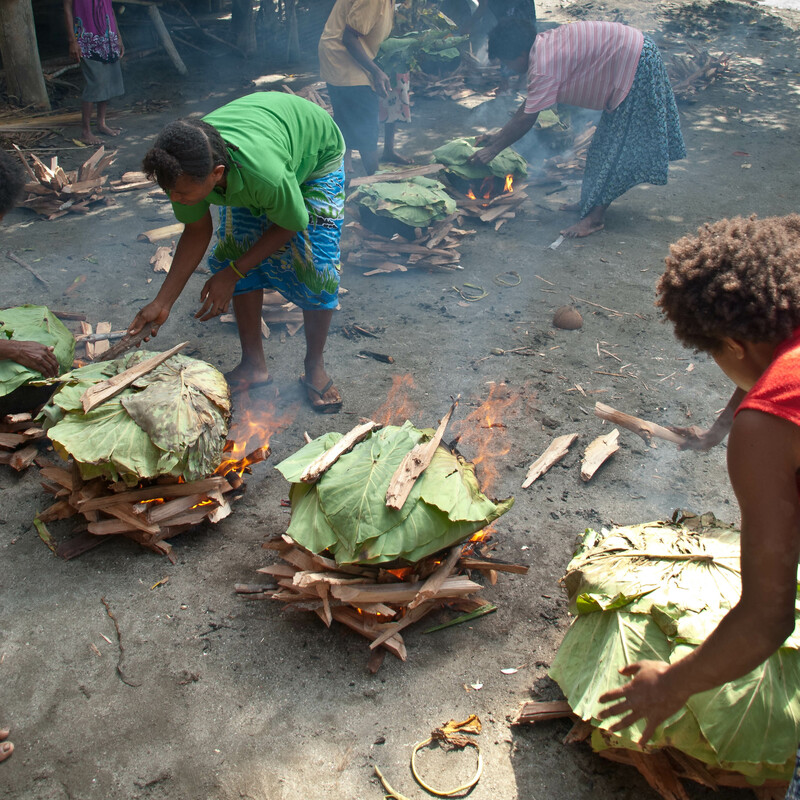 When I came back later that day Betty had finished making the red dye, the dun, and was starting to add it to the tapa with a pandanus brush. Earlier in the day she had collected the inner bark from a saman tree and leaves from the dun tree, which were then heated in a pot over the fire. When the consistency and the deep, blood-red hue was achieved it was ready for application. The tapa fibers also come from the inner bark of a tree, the mulberry, and after being peeled off with the greatest care it is beaten on a wooden log with a mallet that looks like a small cricket bat. The fibers loosen and the bark extends. After one or two hours of beating, the cloth has got the right size and it is then hung to dry in the shade. Betty knows all the secrets of how to get a strong and beautiful tapa, and for her, as for all other Maisin, the keeping of this tradition has become an important part of her identity and it also generates some income for her family and her community. She is proud of her work. Click on the cover image to buy. Or if you are in America, try clicking the flag below.